The staff were not fluent in English, but they have put good efforts to attend us. The hotel is located relatively far from the city center but it can easily be reached by metro or taxi. Relatively spacious, well-equipped, and very quiet rooms. Shopping center and many good restaurants within walking distance. Good value for money! Lost my charger at the room, however front desk responded very slowly and informed there was nothing left in the room. I am very sure it’s there! The staff there were wonderful in Front Desk. Next door has authentic local food if you dare to try. Better than the shopping center next door which hardly anyone in the Restaurant. Supermarket located in the Shopping Center 2 building away which is convenient. Avoid going out at night because there is no road lights. Room is clean and tidy, staffs provide good service. Some managers at the reception are very supportive and have a good command of English, but not all. 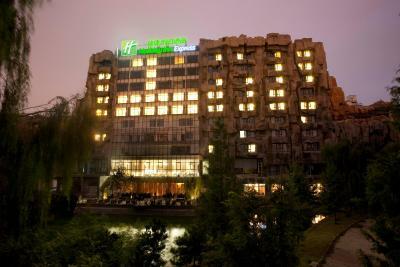 One of our top picks in Beijing.Holiday Inn Express Beijing Minzuyuan is housed in a distinctive glass and stone building, surrounded by bamboo plants and a koi fish pond. A 5-minute walk from Beitucheng subway station, it features free internet and views of Olympic Park and Chinese Ethnic Culture Park. 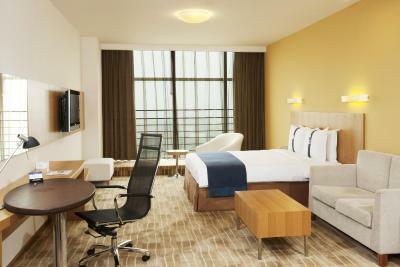 Bright and airy, the modern rooms include a 32-inch flat-screen TV and electronic safe. The private bathrooms have a hairdryer. Select rooms offer views of Bird’s Nest and Water Cube. Central yet quiet, the luxurious hotel provides dry cleaning and laundry services, as well as a business center for guests’ convenience. 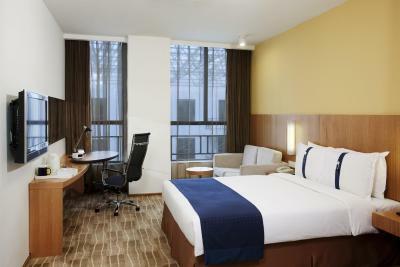 When would you like to stay at Holiday Inn Express Beijing Minzuyuan? This room overlooks the Chinese Ethnic Culture Park. It has a 32-inch LCD TV, fine linens and an ergonomic writing desk. The private bathroom has rain shower facilities. Public parking is available on site (reservation is not possible) and costs CNY 6 per hour. This room has free wired internet, a 32-inch LCD TV, fine linens and an ergonomic writing desk. The private bathroom has rain shower facilities. Room features a flat-screen cable TV, a tea and coffee maker and a safe. 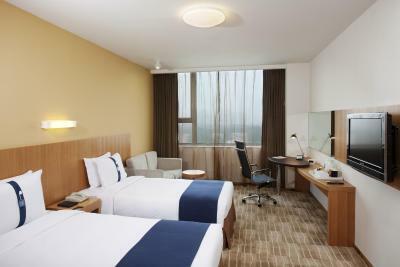 Opened in 2008 Decorated in 2015 418rooms Holiday Inn Express Beijing Minzuyuan is located in the Chinatown of china National Park which belongs to the famous Olympic Business Center. It is adjacent to the Olympic Bird’s nest. Water Cube and Notional and International conference center. It just takes 3 minutes to Beitucheng Subway station(Line 10 & Line 8) on foot. It is also nearby from the Zhongguancun Technical Center,Wangjing Business Ceter and Shangdi Techniacal center. It is really convenient to go to city center or some famous tourist spots like the Nanluoguxiang, Sanlitun, Houhai, Summer Palace and so on, no matter by taxi or by subway. 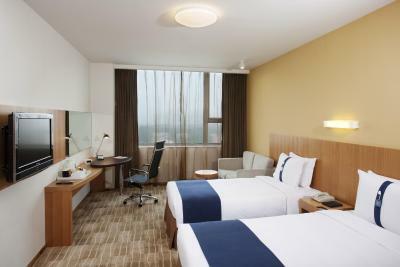 Holiday Inn Express Beijing Minzuyuan is Beijing managed by famous Intercontinental Holtel Group. Hotel equipped wither a 600 square meters of Atrium, 6 Mulitiple-Fuction Halls, an unique sunshine Party Atrium and outdoor lake garden.It could meet different banquet and meeting requests of the guests. 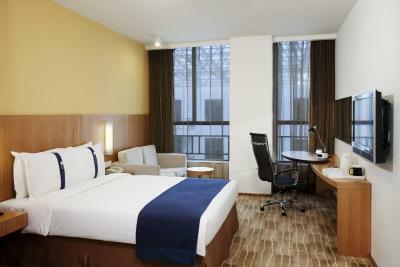 Superior loction and worthe the value’s hotel concept makes Holiday Inn Express Beijing Minzuyuan will always be your“Smart Choice”no matter you are travelling for business, tourists or meeting. House Rules Holiday Inn Express Beijing Minzuyuan takes special requests – add in the next step! One older child or adult is charged CNY 128 per person per night in an extra bed. Holiday Inn Express Beijing Minzuyuan accepts these cards and reserves the right to temporarily hold an amount prior to arrival. The shower drain didn't work. The restroom became a lake after every shower. Yuck! The front desk refused to change my room, because the same style rooms were not available. But I was told I could get a better room if I could pay an upgrade fee. After suffered for 3 days, I was allowed to "voluntarily" downgrade to a smaller room without compensation. The new room's shower drain didn't work either! Yuck! Close to subway station,and lot of eatery Close by. The area next to major stadiums. A room with 2 beds for a family of 4 would have been nice. The service and conditions are unfortunately not as good as before, hence somewhat disappointing. Great location, convenient to reach the subway. The turnstiles door is not working. Need manually pushing. The hotel is in a very poor location. We went in search of restaurants and found only parking lot and alley type area. Very unpleasant and had a horrible dinner as we couldn't find anywhere to eat. We spent 10 nights at different hotels in China and this hotel was the worst quality, worst location and the most expensive. Being from the UK you tend to know what to expect with a Holiday Inn; a decent hotel, good value for money and cleanliness. I unfortunately wouldn’t put this hotel in any of these brackets. The rooms didn’t look like they did on the photos - they were dated unlike the recent refurb the website spoke of. The room smelt of smoke The bathroom had an awful smell in it until it was cleaned the next day. Breakfast can be better. The facilities need some touched up.